Special Containment Procedures: When not in use, SCP-3701 is to be kept in the temporal anomaly storage unit at Site 221. At all times outside of storage, including during testing sessions, SCP-3701 is to have a large chrono hazard sticker placed on it, to prevent accidental misuse by staff confusing it for a simple kitchen timer. No tests are to be performed outside of the safe settings that have been designated, unless a level 4 researcher or higher has overruled the safety precautions. 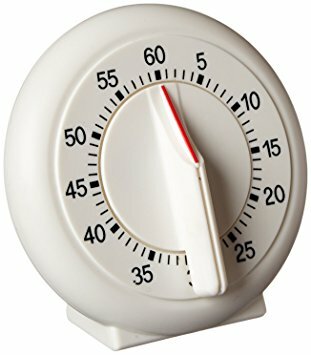 Description: SCP-3701 appears essentially identical to a standard 1 hour kitchen timer. However, it is extremely resilient and to date, no amount of heat or pressure has been able to cause even superficial damage to the object. SCP-3701 was discovered inside of SCP-728 following a routine test. Initial experimentation on SCP-3701 revealed its anomalous temporal properties. When an individual holding the object sets and starts the timer, they immediately cease to exist in our timeline, and enter a separate, parallel timeline. The user will exist in this alternate timeline for the duration the timer has been set to, and will be enveloped in a temporal shield, preventing direct, indirect and quantum interaction with matter in the alternate timeline. Notably, the rate of time in this alternate timeline will move at an accelerated rate from the perspective of the individual in it. Testing has proved that the user will witness a duration of 10^(n-1) hours of the alternate timeline, where n represents the setting in minutes on SCP-3701. For example, if the user sets the timer to 2 minutes, they will experience 2 minutes from their perspective, but will witness 10 hours of time passing around them in the alternate timeline. Subjects have described this effect as being similar to "watching a movie in fast forward." With each additional elapsed minute from the perspective of the user, the rate of time in the alternate timeline increases by a factor of 10. This makes precise events of the far future essentially impossible to detect. Following test 3701-5, it was discovered that the temporal shield weakens significantly the instant before the user is returned to our timeline. This has led to restrictions of the settings that users may test on SCP-3701. When the timer reaches 0, the user is transported back to our timeline in the relative location they were in the alternate timeline. No chronic or acute effects have been recorded from using the device in the designated safe settings. Chrono-Link is the brainchild of Dr. William Atlas, created as a means of obtaining and transmitting information across alternate timelines. It's original iterations were built off of the temporal sinks designed and used in the now defunct Peregrine Mission. Recent advancements in quantum computing, and specifically the allocation of two Z-4 quantum supercomputers to Site 221 have allowed this technology to be properly tested. Chrono-Link uses advanced quantum tunneling models to accurately transmit and receive discrete data packets across timelines. However, this is still extremely computationally demanding, and therefore only simple messages can be transmitted back and forth, even when site 221 commits ~90% of it's computational power to the program. Hopefully, continued research with SCP-3701 can further increase the foundations cross-temporal communication capabilities. Results: Subject was instructed to go into the break room on site and make note of events that occur over the hour as best as he can. After setting the device to one minute and starting it, subject disappeared and was absent for one minute before reappearing in the break room. Subject was able to accurately point out where various individuals would sit for lunch and what they ate, despite having no prior knowledge. Results: Subject asked to note various key events during the day, such as what was served for dinner, where his alternate self traveled and which researcher sat in a designated chair in the break room. In addition, he was specifically asked to only disclose the information to specified parties. It was discovered that if individuals are told of activities they do in the future timeline, they still have the free will to prevent them from happening, but without intervention, events in the future alternate timeline will eventually occur in our timeline. Results: Upon returning to our timeline, subject notes that the longer he remains in the alternate timeline, the more difficult it becomes to perceive specific events, due to the accelerated rate of time around him. No other significant analysis. Results: Subject notes large volume of people moving away from the containment cell of of SCP-████ and armed guards running towards it just prior to leaving the alternate timeline. Inquiry into this information led to the discovery of a severe containment vulnerability in the cell of SCP-████, which was promptly corrected. A: TEST. NOTIFY. IF. RECEIVE. A: LESS. WORDS. KEEP. SIMPLE. A: SYSTEM. CRASH. STILL. THERE. S: STILL. HERE. OUTSIDE. NOW. S: LARGE. EXPLOSION. SITE. DESTROYED. S: SKY. FLASHING. RUBBLE. EVERYWHERE. The described flashing sky was attributed to the rapid changing of day and night due to the accelerated time subject was experiencing. Dr. Atlas notes this event as a potential XK-Class scenario occurring within the next 1100 years. A: TAKE. PHOTO. SEND. HERE. A: PHOTO. NOT. RECEIVED. STANDBY. The photo that the subject sent once again overloaded the Chrono-Link system, requiring another 5 minute reboot. Final transmission occurs during the last minute of test. A: ANY. CHANGE. IN. SURROUNDINGS. S: HOW. MUCH. TIME. LEFT. A: NOTED. 15. SECONDS. LEFT. A: 5. SECONDS. LEFT. STAY. CALM. S: HOT. HOT. HOT. HOT. Following this test, SCP-3701 returned in the relative vicinity of the testing area, followed by a severely burned corpse that was identified as the subject via dental records. Testing revealed that the temporal shield provided by SCP-3701 diminished significantly enough at the end of its duration to allow the increased heat of the future sun to terminate subject. Testing of SCP-3701 on settings exceeding 12 minutes now require authorization by level-4 researchers or higher. Under the order of Dr. Atlas, no further cross testing of SCP-3701 shall be conducted without sole approval of Dr. Atlas or an override by the O5 council. Parameters: Subject instructed to set SCP-3701 to 60 minutes, corresponding with an equivalent alternate timeline duration of 1.14 x 10^55 years. Subject then instructed to enter SCP-728 and begin timer once doors are closed. Results: No anomalous activity reported for the duration of the one hour timeline set. No contact could be made with subject during this period through the Chrono-Link system; Dr. Atlas notes that this is likely due to the properties of SCP-728. Following the expiry of the one hour duration, sensors recorded a massive drop in the local temporal and hume field. Following this drop, a spacial-temporal anomaly formed in the center of the test area, triggering temporal shielding devices to activate. Current research into SCP-3701 has been postponed, and resources have been shifted into studying this anomaly and what may lie on the other side. In addition, it is noted that there are no records in Foundation databases of the subject participating in this test, and no researchers involved claim to have any memory of any specific traits of the individual.